Hello Beach is a new patent-pending beachcomber bag for both kids and adults. My kids love collecting seashells, but wet, sandy shells, left in plastic buckets in the hot summer sun or car create a awful smell that you wonít want to bring home. Our darling treasures bag is unique for little fingers to collect their cherished collections without bringing home stinky, sandy buckets of wet shells. Our larger tote is perfect for drying out bathing suits. 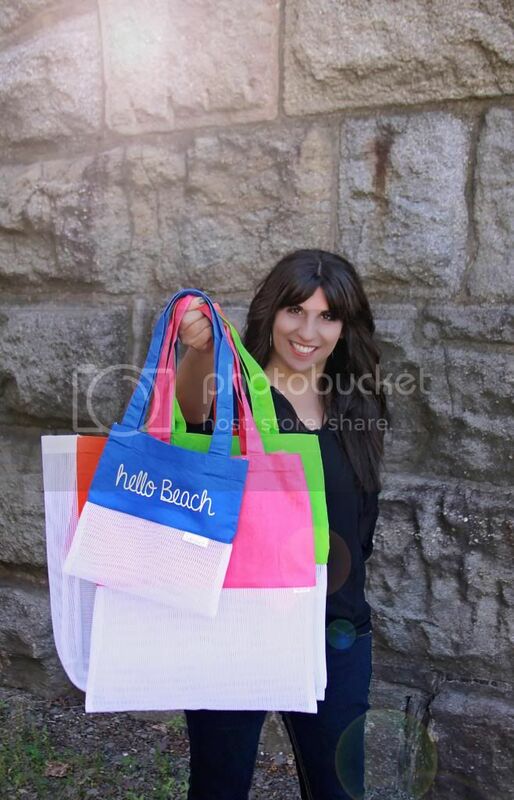 What makes our tote different? The top half is 100 cotton, while the bottom half is made of durable woven mesh. The larger size holds towels, toys & more. Shake or rinse and sand stays at the beach. The kid's size bag will be their official shell (or treasures) collecting bag! Both styles are also great for collecting sea glass or drift wood. With the bottom made of mesh, kids can rinse the sand right off their shells themselves, while keeping their treasures inside. Both totes are available with personalization options (for an additional fee). Besides personalizing with a childís name, retailers could order a name drop program with My First Shells from their town or resort name, etc. for shore point boutiques or hotel gift shops. Created by a mom and hand sewn in the USA! - Measurements: Treasures Tote measures: 9"w x 10"L not including handles. Beach Bag measures: 14-1/2"w x 16"L not including handles. Handles are 10 inch long on both styles. Please visit our sister store .Monogram Muse for premium personalized gifts.